Foam in a pool is due to the water being “thick.” This thickness creates bubbles, lots and lots of bubbles. The bubbles are filled with air that can come from your return jets that blow the water back into the pool or the wind outside. One of the main causes can be the type of algaecide you use. You want to look for algaecide that is “non-foaming,” and don’t overuse it. Follow the directions on the back of the bottle. You should only need a few ounces per week. You can stop using algaecide altogether if you follow basic pool chemistry and keep your water clean. Cheap chemicals you might pick up at the local big box store (Wal-Mart, Sam’s Club, etc.) could be harmful to your pool water. I have seen chlorine pucks that are unstablized – a huge waste of money – and algaecide that comes in gallons. Find a high concentrate algaecide that won’t cause foaming. This may be a tough rule for your kids to follow, but rinsing off in the show before swimming can prevent foam from developing. The shower will rinse off any makeup, shampoo, or soap residue on the body before introducing it into the pool. Funny as it may be, I have heard stories of pranksters throwing bubble bath liquid or laundry detergent into pools to foam-up. This is not cool. It will make it very hard for you to get rid of. In fact, you will have to drain and refill the pool quickly or order to get rid of the foam. This is very rare of course. If the foam is caused by algaecide, it will breakdown on its own. Just give it a few days to enter into the water all the way. You can skim the foam off the surface to help speed things up. To get rid of foam, you need to make sure the chemicals in your water are properly balanced and at the correct levels with some test strips. 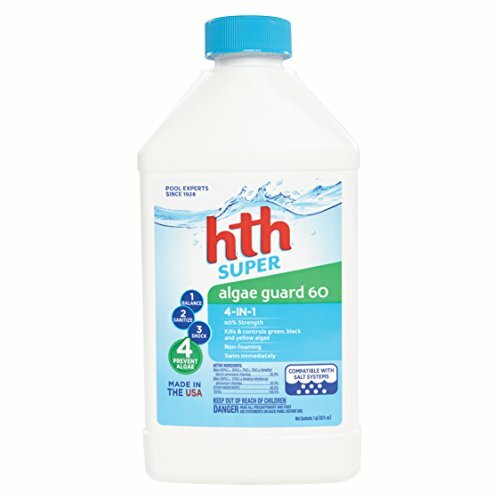 Check the pH and alkalinity and adjust them to the proper levels if needed (pH should be 7.4 – 7.6 and alkalinity should be between 100 – 150ppm). If adjusting these levels alone doesn’t get rid of the foam, you can shock the pool by adding chlorine or non-chlorine shock. I suggest just adding 1 pound per 10,000 gallons of water. For instance if you pool is 21,000 gallons, you would add 3 pounds of shock, and do it at dusk and let your pool run overnight. If all else fails, you can purchase an anti-foam chemical to add to the water. This will get rid of the foam right before your eyes. I would only use this if you’re in a pinch – right before a party or before you have guest over and don’t want to be embarrassed that your pool looks like a washing machine. If you plan to go away on vacation this summer, but fear that your pool might turn cloudy or green, here are some tips to prevent it.